﻿ AC or DC Stand Mixer: Which Is Better? Not sure whether to choose an AC or DC driven stand mixer? Afraid you’d pick the wrong one? Got questions? Have searched and did not find the answers? Sadly, there aren’t until this. Consumer stand mixers have had a long relationship with AC motors. But DC motors are picking away at that exclusivity. As if there aren’t now enough criteria to take into account, here’s another thrown into the pile. Frankly, you won’t find a resource that tackles this subject. 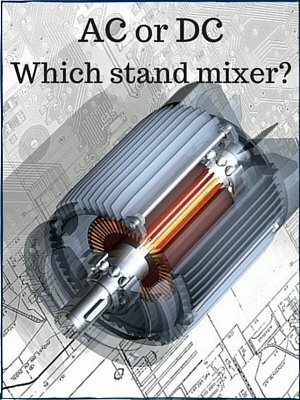 Sure, there are write-ups comparing AC and DC motors in general, but none that specifically relates to stand mixers. We just want to know how it will affect our cakes and breads and the way we make them. Period. Luckily, I have an engineer-husband who is my number one go-to resource when it comes to home appliances. We had several conversations about this subject. I made a few runs of dough in my KitchenAid Pro 600 series which has an AC motor. Then we went over to a friend’s bakery to witness his commercial mixer (with a DC motor) do the job. Hubby does not need to see those mixers in action to give me answers. I wanted to see his explanation in action. What Is An AC Motor and What Are Its Applications? What Is A DC Motor and For What Is It Used? Comparing AC and DC Stand Mixers: Which Is Better? The motor derives power supply from the mains and generates varying voltage. As such, energy that flows into it is not steady. A direct current (DC) motor obtains energy from batteries or cells and produces constant voltage which results in a constant and steady flow of energy. The constant supply of energy makes a DC motor suitable for operations that require excellent speed and torque control. It also consumes lesser energy. However, it requires more starting power. It generates the same mechanical power as a comparable AC motor but with lesser power consumption. Torque is often mentioned when evaluating stand mixers, but it is often a murky metric. It is not measured. Descriptions usually just say “great torque” and other similar adjectives. That’s to be expected because you can only ever gauge a stand mixer’s torque when you use it. What is torque anyway? It is the rotational force that moves objects around. When it comes to baking, torque plays a vital role in kneading stiff dough. It has to be sufficient to be able to pound that dough around without stalling or worse giving up. “Tell us which is better”. I can almost hear you say that. I concede. But is one really better? Firstly, let’s have a look at the Table below which summarizes the Pros and Cons of each motor type. Smaller and lighter motor head. It has to be stressed that wattage is not a one is to one ratio when it comes to AC and DC stand mixers. It is a huge mistake to think that an AC model with a 300-watt motor delivers the same power as a 300-watt DC unit. Nah, the DC motor driven stand mixer is stronger and tougher. It is the equivalent of someone who has been lifting weights in the gym…lots of muscle and power to move heavy weights. You will see lots of comments saying that this or that stand mixer with an AC motor gets hot, while the DC model only gets warm. Here’s the thing…the higher the wattage the hotter a motor gets. Also, a mixer with a DC motor does not strain because torque is consistent. As a result it performs lesser work and consumes less energy. Therefore, it does not get as hot as an AC powered unit that has to expend more energy to get the same job done. Owing to its consistent speed and torque, a DC stand mixer does not strain, stall or wobble when a mixture like dough turns stiffer. It just muscles through it. Are you now concluding that a DC mixer is better? It is…if power and brawn is essential to you. But, hey, it does not follow that we should all be choosing it. We have to use reason and common sense. Ask yourself for what are you going to use a stand mixer now and in the future. It would be unreasonable and a waste of money to buy an expensive and hefty DC driven stand mixer if you are only ever going to make cakes, cookies and frosting in single or double recipes, and only occasionally for bread. Powerful stand mixers also have big bowls. Smaller quantities may get lost in it and not be blended thoroughly. If you will use it for making bread daily. If you prepare several loaves of bread in a single batch. If you make big amounts of anything…cakes, cookies, frosting, etc. Even if it’s just frosting if it’s several recipes with several pounds of sugar, you will need the power of a DC motor. Expectedly, commercial baking mixers have DC motors. However, more and more people are making their own bread for several reasons.The trend prompted stand mixer manufacturers like KitchenAid to offer DC models for home use. Its first is the Pro Line series, but the proprietary Professional 6000 HD which has a smaller capacity, is fast overtaking it. Much like other criteria, choosing between a DC or AC stand mixer is primarily dictated by your needs. I have an old k5ss. Considering to update to a fun new color. What pull be a comparable model? My old work horse still runs great but would like a new one. I find you posts very helpful! You’re lucky to have an old K5ss. Is it a 5-quart model? I’m glad that you find this article helpful. You guessed it right. Because a DC motor is superior for tough tasks it does not have to work as hard. You may want to learn more about the KitchenAid Professional HD. It has a 1 HP DC motor and costs less than most comparable AC stand mixer. Your article truly is the most helpful/informative i’ve been able to find about choosing between an AC or DC motor for a mixer. I have a side question to throw at you. I plan on using a meat grinder attachment A LOT for my mixer. I’m comparing a 575 watt AC mixer with a 1hp DC mixer. I’m going to take a wild guess here that the increased torque in the DC mixer is going make for less wear on the mixer while grinding correct? Just trying to pick the machine that can best handle it best over the years. Thanks so much for the info and I sincerely look forward to hearing back from you.